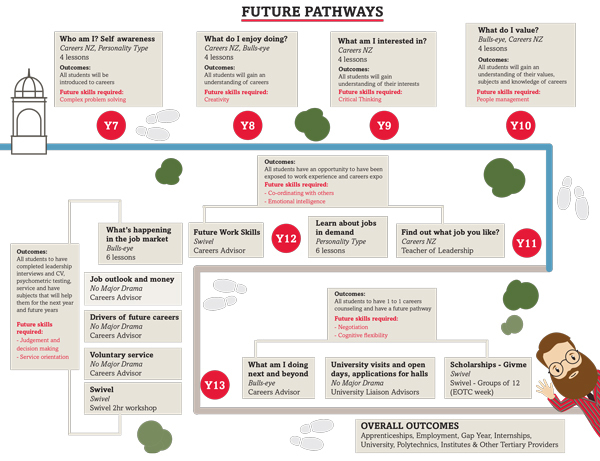 Delivering a Personalised Career Education and School-wide participation in a Future Pathways Programme (Careers) enables students to make better informed decisions about their future direction. Career education is incorporated for all year levels through the pastoral care tutorials run through the House system. There is a well resourced careers room highlighting a variety of tertiary institutions and industry training establishments. Appointments for career interviews can be made at anytime with the Careers Adviser Mr Gary Henley-Smith, careers@scotscollege.school.nz, ph 380 7655. Senior Students are provided with access and resource from Career Central platform (An online 24/7 portal for students and staff) and integration of Swivel Careers with Year 11 Work Experience, Y12 Psychometric Testing and Year 13 Workshops. Students can develop future plans using Career Central’s online tools, career education, work placement, workshops, job shadowing, work experience and university visits. This platform provides personalised and targeted communication ensuring no one misses out on relevant opportunities or receives irrelevant information. Careers Central utilise students’ Bulls-eye quizzes. Which looks at broad occupational interests, school subject strength and detailed job tasks to provide best fit results against 27 future pathways. University and non-university pathways are explored. Career Central’s quiz two is designed for senior students who wish to explore pathways which do not require a university degree. This assessment looks at broad occupational interests and detailed job tasks to provide best fit results against 24 future pathways. Swivel Careers is a personalised in- depth careers coaching service that helps students set a pathway to a career they’re passionate about. Swivel consider not only student’s personality, skill-set and interests but also their passions and ambitions. Year 12: Students will undertake a Psychometric Test and receive an individual report. Year 13: Students will attend two day courses during EOTC week covering: digital imprint, stress management, cover letter and CV writing, interview preparation, speed interviewing and video interviewing and reflection sessions. All Year 13 students are required to fill in an online questionnaire with Bullseye. Bulls-Eye is a New Zealand online career quiz and an integrated resource hub that provides an engaging career exploration process, which helps teens focus on their interests and skills to assess over 40 career paths. Bulls-Eye focuses on occupations that are available in the New Zealand employment market, matching student interests and aptitude with potential careers and provides information about different industries, job sectors and learning pathways. All Year 13 students are emailed a unique login password at the beginning of the year and after completing the questionnaire all Year 13 students are required to make a careers appointment with Careers Advisor Mr Gary Henley-Smith to discuss their results. Year 11 students also complete a Bulls-Eye online test that helps guide their work experience placements. www.careers.govt.nz – A very valuable resource for students and a good starting point. Generosity is a website that lists all possible scholarships available in New Zealand. or by entering your library card details on the Wellington City Library Website. It cannot be accessed from home. University websites also list scholarships available at the particular university.